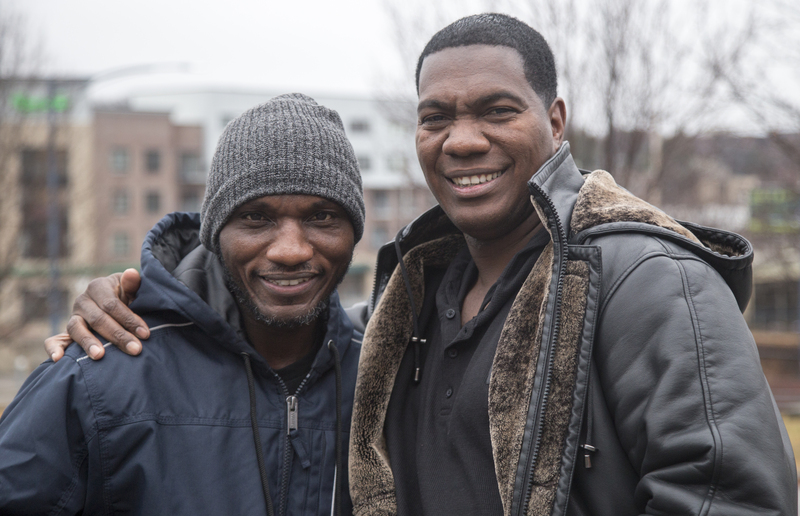 Cedric Burnside (left) poses with his cousin, Kent Burnside (right) before his Dec. 1, 2018 performance in Des Moines, Iowa. Copyright 2019 Iowa Public Radio News. To see more, visit Iowa Public Radio News. The Grammys are tonight. And among the nominees in the best traditional blues category is Cedric Burnside. Blues music runs in Cedric Burnside's family. He's the grandson of the late R.L. Burnside, who was the best-known of a group of musicians who play a style called North Mississippi hill country blues. Iowa Public Radio's Clay Masters reports Cedric is picking up where his grandfather left off. 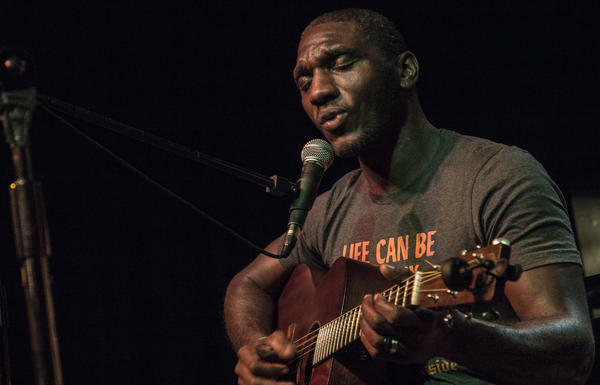 CLAY MASTERS, BYLINE: The first song on Cedric Burnside's latest album is "We Made It." It's about growing up poor in Mississippi. CEDRIC BURNSIDE: (Singing) I came from nothing. I done been lower than low. C BURNSIDE: Actually, getting running water (laughter) - you know what I'm saying? When you don't have running water and you finally move in a place that has running water, you done made it. MASTERS: That happened when his grandfather, R.L. Burnside, finally got water when Cedric was 12. MASTERS: Cedric grew up mostly in his grandfather's house along with many of his cousins. One of them was Kent Burnside. KENT BURNSIDE: We grew up together. We ate at the same plate, shared the same socks. I might've stole a couple of his socks. K BURNSIDE: You know what I'm saying? MASTERS: Cedric got his start in music at 13, playing drums in juke joints with his grandfather, which he also sings about on his latest album. C BURNSIDE: (Singing) My school was a juke joint, from a kid till I was grown. And blues is really all I've ever known. MASTERS: Cedric went on to tour extensively with R.L. R L BURNSIDE: (Singing) Love is the devil, but it won’t get me. On drums is my grandson, Mr. Cedric Burnside. MASTERS: Like his grandfather, who he calls Big Daddy, Cedric also plays guitar. C BURNSIDE: (Playing guitar) And this is a song I used to hear my Big Daddy play all the time, "Just Like A Woman." MASTERS: North Mississippi hill country blues is a stripped-to-the-bone style of music, says Greg Johnson, University of Mississippi blues curator. GREG JOHNSON: The emphasis is really on the rhythmic drive of the piece. You get a little riff going, a little groove going in the guitar. A lot of times, you won't change to another chord. C BURNSIDE: (Playing guitar, singing) There was Adam had to make a bee, that Eve had to messin’ that old apple tree. That's just like a woman. That's just like a woman. That's just like a woman. They'll do it every time. So the style of hill country blues is very unorthodox. It's just - it's feel music, I like to call. MASTERS: It's a style of music R.L. Burnside played on weekends, after working as a sharecropper during the day, as he said in a 2002 documentary, "You See Me Laughin': The Last Of The Hill Country Bluesmen." R L BURNSIDE: We'd play, man, from 8 o'clock to 3 or 4 o'clock in the morning, probably get $3. MASTERS: But in the 1990s, things changed. R..L signed to Fat Possum Records, which had him playing in rock clubs across the country. And his music reached an even wider audience when it was featured in "The Sopranos." JAMES GANDOLFINI: (As Tony Soprano) Look at this baby I caught right off the pointe here. R L BURNSIDE: It's bad, you know. MASTERS: Even though his grandfather had, in a small way, made it, he didn't move out of his rural home, says Cedric. He just opened it up to more family. C BURNSIDE: He will give you the shirt off his back. I mean, literally, he will give you the shirt off his back. But he always kept that .38 in his left pocket, you know what I'm saying? He never - never took that out, you know (laughter). MASTERS: R.L. Burnside's attitude towards success certainly inspired his grandson, whose own career inspires his older cousin, Kent, also a blues musician. K BURNSIDE: Well, you know, I'm like, he did it. I mean, I just got to find a different way of doing it because everybody's method ain't same as - you know what I'm saying? But I knew it was possible. MASTERS: And for his part, Cedric wants to be known as more than R.L. Burnside's grandson. C BURNSIDE: Before I leave this world, I want to make my mark. You know, and so that's what I'm trying to do right now. But as I do that, I want to not forget about where I come from and where I learned it from, which is R.L. Burnside. C BURNSIDE: (Singing) But we made it. But we made it. But we made it. Yes, we did. MASTERS: For NPR News, I'm Clay Masters. C BURNSIDE: (Singing) Yes, we did. Yes, we did. Yes we did... Transcript provided by NPR, Copyright NPR.